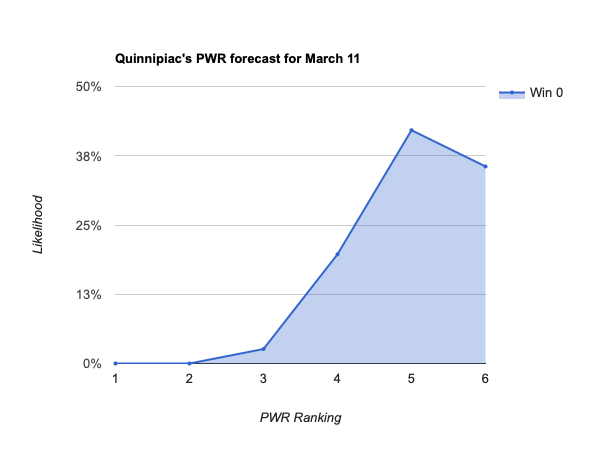 Everyone’s favorite college hockey ranking scheme, KRACH, has the feature that it can be used to predict the likelihood of a team winning a matchup against another team. So, it is possible to use KRACH likelihoods to determine the likelihood of each team advancing through each game of the NCAA hockey bracket. On paper, there’s a tremendous advantage to being the #1 seed overall. Not only does St Cloud St have, by about 2-1, the highest KRACH overall; but, they’re also matched up against the lowest KRACH-rated team in the tournament, Atlantic Hockey champ American International. That gap gives the Huskies a formidable 92% chance of winning their opening game, a 67% chance of making the Frozen Four, and a 34% chance of winning the National Championship. The remaining three regions are reasonably balanced, with each having something between a 17%-22% chance of producing the national champ. The 1 seeds are reasonably strong, as rated by KRACH, with a 65% chance overall that one of them becomes the national champ. This entry was posted in KRACH on March 28, 2019 by jim. Though 7 conference tournament games remain, there’s not a lot of drama left around who will make the NCAA tournament. Both participants in the NCHC and ECAC tournaments are already in. That’s 14 teams in, and leaves 2 slots. But, we’re already counting their opponents, Minnesota St and Northeastern as in. So, if Minnesota State or Northeastern win, that leaves an additional slot and an opportunity for another team to make it at-large. What needs to happen for my team to make it? This entry was posted in Uncategorized on March 23, 2019 by jim. The following 10 teams are guaranteed an invitation to the NCAA tournament on the basis of their PWR. Who else can get in? Those marked with a (*) can only get in if they win their conference tournament. Those marked with (in) will make the tournament regardless of conference outcome. But, what about the rest? There are 16 spots in the NCAA tournament. 10 participants are already known (see above). The winners of the Atlantic Hockey and Big Ten tournaments are not only guaranteed spots, but are the only teams from those conference tournaments that will get spots, so you can think of those two spots as reserved for one of the 4 AH teams and one of the 2 AH teams, respectively. That leaves 4 spots total for a combination of the champions of the remaining 4 conferences and the 5 teams that can make it at-large (there is some overlap between those two groups). How many teams are selected at-large depends how many of the 4 remaining slots are taken by teams that aren’t already in by virtue of their PWR. For each of Hockey East, ECAC, NCHC, and WCHA that are won by a team that is already counted as being in, an additional spot is available for a different team to make it at-large. 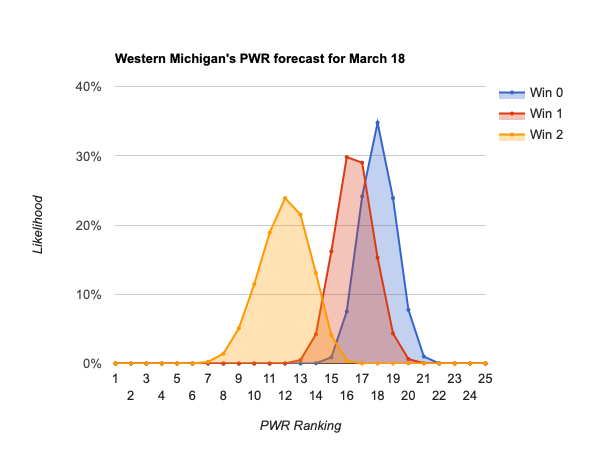 This entry was posted in forecasts on March 21, 2019 by jim. Will Arizona State make the NCAA tournament? The number question I still get every week is, “Will Arizona St make the NCAA tournament?” The answer to that question is still, “very likely”, but it’s not quite “definitely”. Because Arizona St is done with regular season play, any movement in its PWR will be because of the movement of other teams. To understand what might happen, the place to start is with the teams around #10 Arizona St, because those are the teams that will either climb above or fall below the Sun Devils and change their ranking. Note the big gaps between #5 Quinnipiac and #6 Ohio St, and between #14 Harvard and #15 Notre Dame. The range #10 Arizona State is likely to operate in is between #6 Ohio St and #14 Harvard. 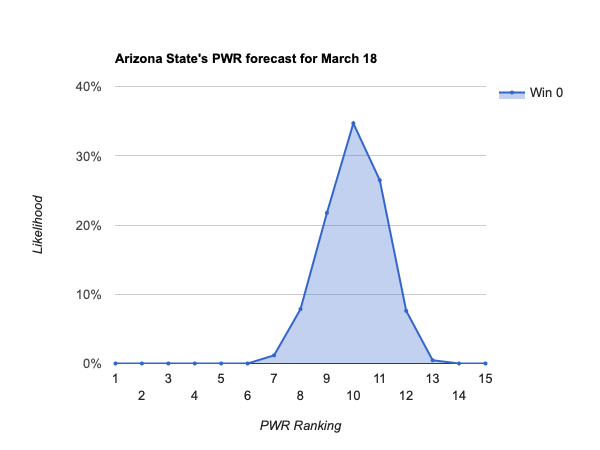 But remember that there’s a little bit more to PWR than RPI; if you look at ASU’s PWR details (linked above), you’ll see that the comparison with #6 Ohio St wouldn’t be flipped by Arizona St surpassing them in RPI, so Arizona St’s real likely range is #7-#14. To understand what’s going to make ASU moves around within that range, it helps to start by looking at what is likely to happen this week. 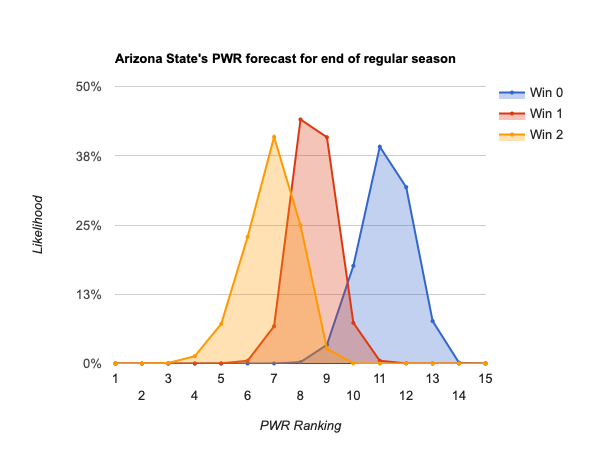 Unlike last week, when I noted that ASU had a lot more downside potential than upside (and indeed they fell 2 spots), their outlook this week is a pretty balanced bell curve around their current #10 ranking. (Note that those predictions rely on KRACH weighting for likelihood of game outcomes, so that is not a share of possible outcomes or an assumption that each outcome is equally likely). In the world of 1% outcomes, the simulations say that Dartmouth beating #14 Harvard is more important than #13 Western Michigan’s games, but I’m not sure why. The more of those that occur, the better for Arizona St; the fewer, the worse. Of course, more games will played after this weekend but before NCAA tournament selection. Because we’re in conference tournament play now, the games above have an additional impact on Arizona St’s fortunes beyond their immediate impact on PWR. Winning teams will get more games, whereas losing teams will not. That’s why I’m comfortable saying Arizona St is likely to make the NCAA tournament—if the teams around ASU lose this weekend, not only will Arizona St have a better PWR, but their potential to fall will diminish significantly because those teams who could most harm ASU’s PWR won’t have any more games; further, even if the teams around ASU do win this weekend, pushing the Sun Devils into a worse PWR, those teams will play again with some chance of losing and falling back below Arizona St. 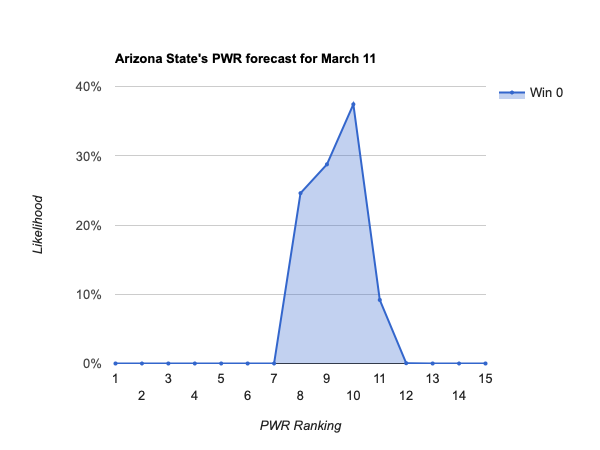 This entry was posted in forecasts and tagged Arizona State on March 14, 2019 by jim. This weekend most teams are playing best of 3 conference tournament play-in series, with the exception of two Big Ten semifinal games. The range of likely outcomes isn’t particularly broader than usual, because the best a team can do is still two wins and the worst two losses. 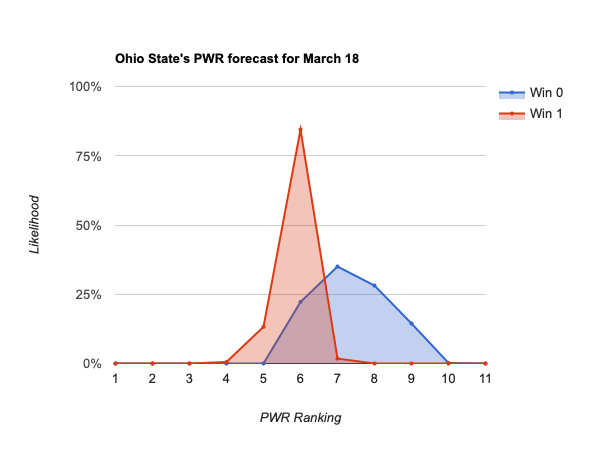 But, this weekend’s interesting twist is that the worst outcome would also result in no additional games until NCAA tournament selection, so some teams will start to lose control of their own PWR destiny this weekend. #1 St Cloud is probably going to be #1 a week from now, no matter what happens this weekend. 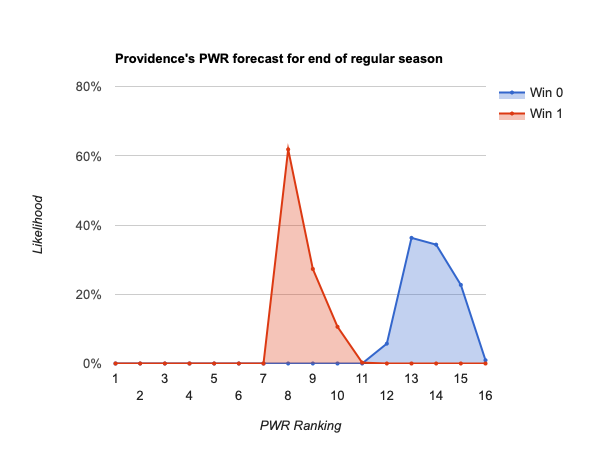 The Huskies’ RPI of .6175 is simply unassailable, with #2 Massachusetts at a distant .5827. The top 6—#1 St Cloud, #2 Mass, #3 Minn St, #4 Minn Duluth, #5 Quinnipiac, and #6 Ohio St—should all still be top 10 after this weekend. Their worst case scenarios for the weekend would also mean the end of their conference tournament play, so a top 10 finish this weekend would make it very likely that they would still be positioned to receive at-large bids to the NCAA tournament by the time conference tournaments are over. It might appear that Ohio State really belongs in the group below this one, with its RPI of .5595 being much closer to #7 Denver’s .5572 than #5 Quinnipiac’s .5714. 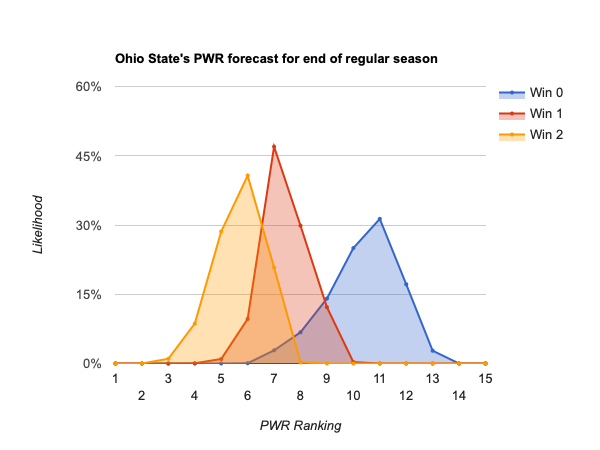 But, because Ohio State can lose at most one more game, it’s difficult for them to drop much below #10 at the worst (i.e. under a 1% chance). Even then, everything below them would have to go just wrong for the Buckeyes to miss out on an NCAA bid from there. 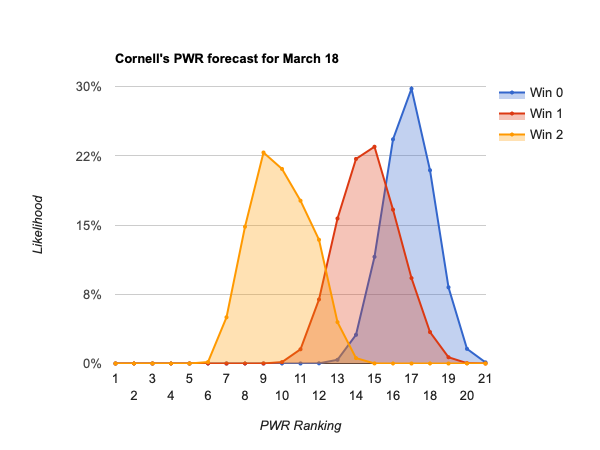 From #7 Denver down to #12 Cornell could end the weekend on the bubble, with a chance of making the NCAA tournament at-large, even with losses this weekend. From #13 Western Michigan down to #22 Lake Superior St can keep their hopes of an at-large bid alive by winning this weekend, but will probably move out of position for an NCAA bid if eliminated. 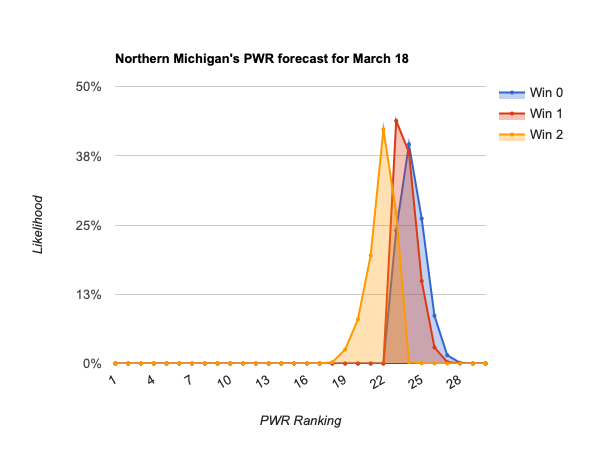 #23 Northern Michigan and below stand little chance of making the NCAA tournament at-large, so their only likely paths to the NCAAs are through a conference tournament championship and automatic bid. This entry was posted in Uncategorized on March 11, 2019 by jim. With some conference tournaments beginning this weekend, the NCAA tournament outlook for most teams is pretty well known. But, a few teams in the middle are jockeying for bubble position, hoping to get an at-large bid should their conference tournament runs fall short. 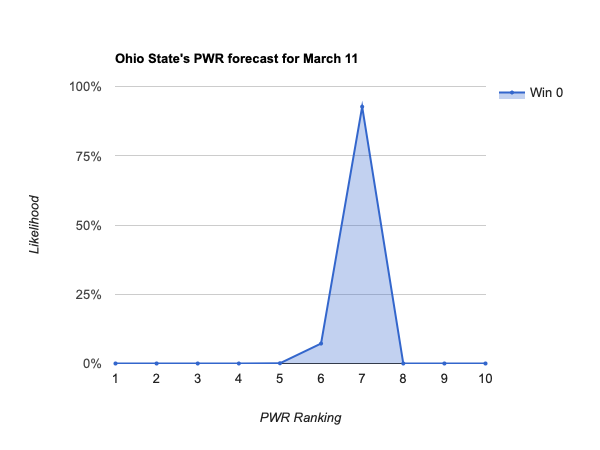 This article looks at what is likely to happen in the PWR rankings this weekend. #1 St Cloud is almost certain to still be #1 next Monday, no matter what happens this weekend. #2 Massachusetts through #7 Ohio State should still be the same set of teams, but perhaps reshuffled based on outcomes (even the teams not playing, #5 Quinnipiac and #7 Ohio State, could move a bit). #8-#20 are fighting for bubble position and (where applicable) hoping to move on for additional opportunities to improve their PWR and at-large bid likelihood. #21 Minnesota and below are almost certain to remain outside the top 16, regardless of this weekend’s outcome, so facing long shots to make the NCAA tournament at large. 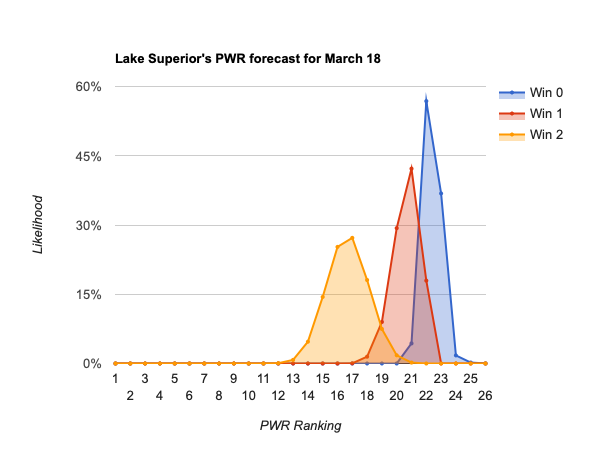 This entry was posted in forecasts on March 7, 2019 by jim. 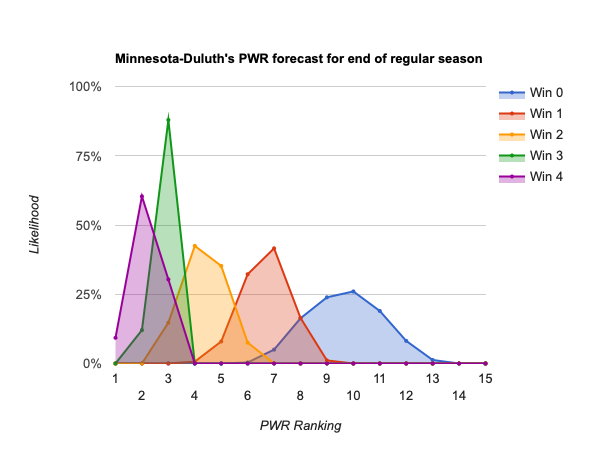 Which games this season had the most impact on PWR? Inspired by a tweet earlier this week by @JoeMeloni, I thought it would be fun to look into the season’s most impactful games on the PWR. 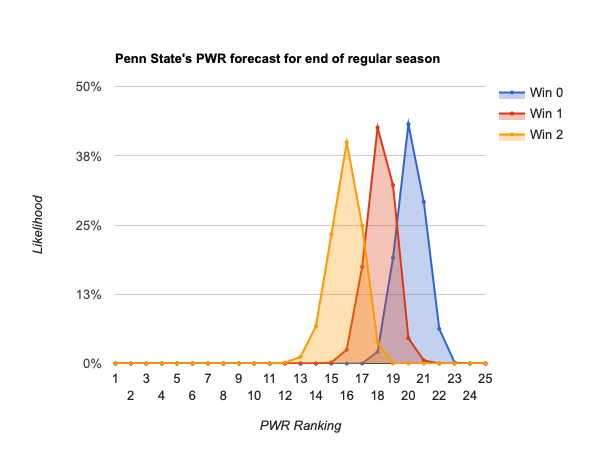 Just playing around with the Pairwise. That Canisius sweep of North Dakota is one of the defining results of the season. UND would be 10th right now if it had gotten two wins in Buffalo. Ok, those were some big impacts for one game being different! But lower ranked teams tend to be more volatile, and those didn’t really have any impact on the NCAA tournament (which is what PWR is for). But, there are also plenty of examples of single game outcomes potentially having a significant impact on NCAA tournament selection. #13 Harvard — Could be #8 (5 spots higher, and in solid position for an at-large bid) if the Crimson had instead taken the 6-7 season opening loss at Dartmouth. But, they could also be #18 (5 spots lower, and outside the bubble) if they had instead lost a 2-1 victory at Quinnipiac on January 12. #14 Western Michigan — Could be #10 (4 spots higher and in good shape for an at-large bid) if they had won the season opener that they lost 2-6 hosting Bowling Green (winning the October game at Bowling Green wouldn’t have helped quite as much). But, they could also be #20 (6 spots lower, and off the bubble) if they had instead lost in the 5-4 victory hosting Michigan on October 20. 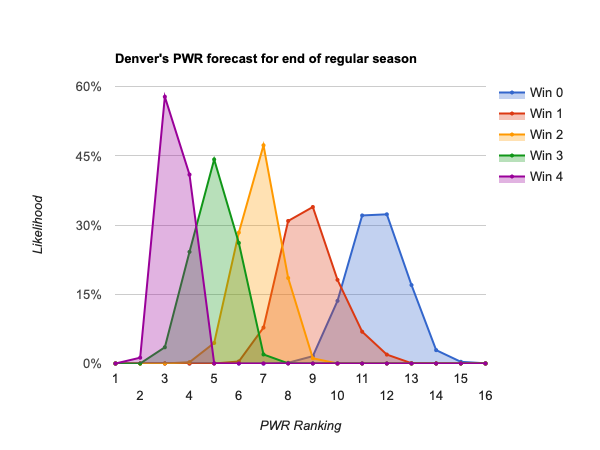 Some noticeably different PWR outcomes are even possible for teams based on games completely outside their control. Some games have impacts on non-participants that, while relatively smaller than those above, have significant playoff implications. This entry was posted in Analysis of PWR on March 5, 2019 by jim. With one weekend before conference tournaments begin, who’s positioned for an at-large NCAA bid? With just one weekend of play remaining until the first conference tournament begins, we know a lot more about who is likely to get an at-large bid to the NCAA tournament than we did even just a couple weeks ago. Remember that any team that wins its conference tournament gets an autobid. 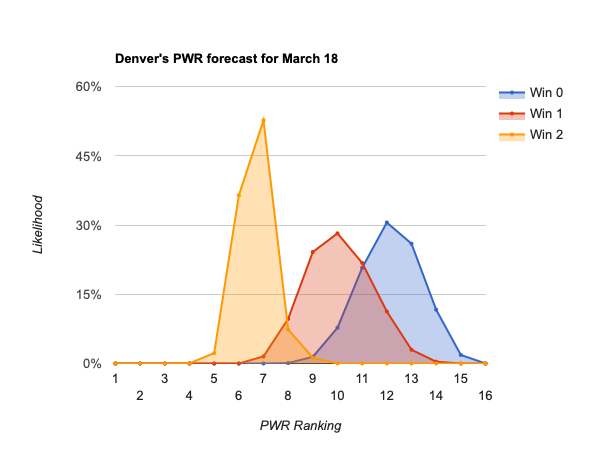 Because we don’t know how many tournament slots will go to autobids that wouldn’t have made the tournament at-large, we can’t be sure what PWR ranking will be required to make the tournament at-large, but it’s likely to be in the 13-14 range. So, we’re primarily looking for the likelihood of teams that don’t win their conference tournaments finishing around #13-14 (or higher), but will call anything in the 12-15 range “the bubble” because of the uncertainty. #1 St Cloud State through #8 Arizona State are probably in, no matter how they perform. Note that there are some unlikely scenarios in which teams like #7 Ohio State, #5 Denver, and even #3 Minnesota-Duluth can fall to the teens by the end of the regular season, which would open the door for missing the tournament with a subsequently poor performance in the conference tournament and some extremely bad luck. But, that’s unlikely. #8 Arizona State is actually a bit safer than those teams by virtue of not having a conference tournament in which they could perform poorly and push themselves lower. 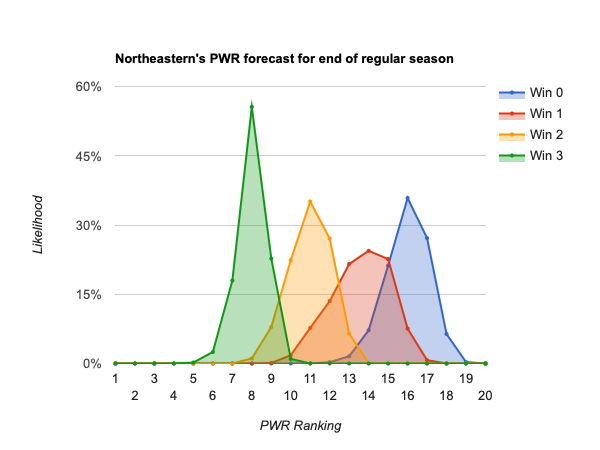 #9 Northeastern through #14 Harvard can come close to locking up an at-large bid with a strong finish, but would still be on the bubble even with a disastrous finish. Then, it would come down to conference tournament performance and quite a bit of luck around other teams’ performances to determine who gets the at-large bids. I debated a bit whether to include Harvard in this list or the next, they’re right on the margin. 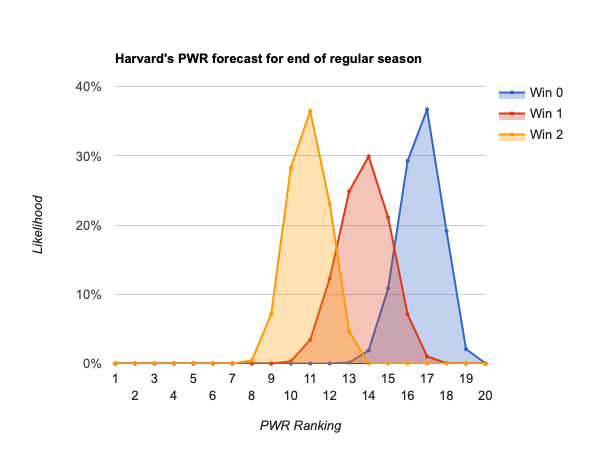 There are scenarios, though not the most likely, in which even with a pair of wins Harvard could end the regular season around #13. #15 Bowling Green through #19 Penn State could make the tournament at-large with a near perfect close to the season, a decent conference tournament performance, and some luck. 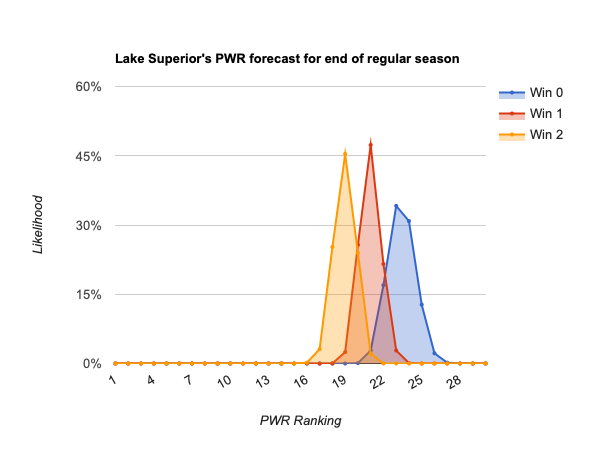 None of #20 Lake Superior, or below, can end the regular season in the top 16. 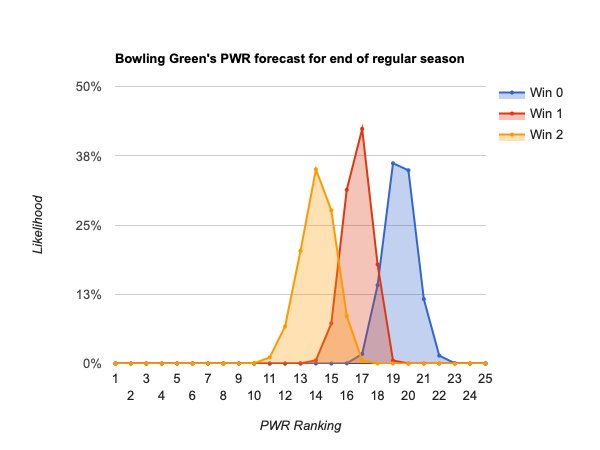 So, it would take an improbably strong conference tournament performance and some luck to get an at-large bid (remember that winning the conference tournament guarantees an autobid, so the at-large bid would only come into play with a loss in the conference tournament, which would likely also have pushed down the PWR ranking a bit). 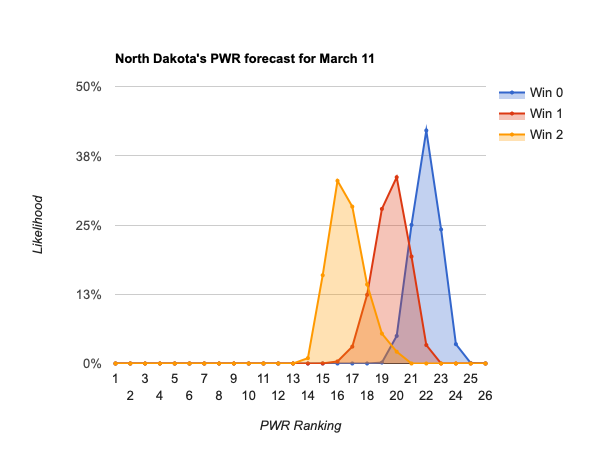 This entry was posted in forecasts on March 1, 2019 by jim.